Design area: the concept you propose shall be designed for a pharmacy of about 170 sqm (min 120 sqm, max 300 sqm), that you may dispose of as you prefer, inserting architectural elements, walls and other elements to create the various spaces described below. ⦁	the new retail space shall include also some corners dedicated to selling nutritional supplements and other medicines that do not require medical prescription. The chemist and his/her team will move around these dedicated spaces to facilitate the relationship and the direct contact with the customer, while avoiding any unnecessary waiting times. Do not suggest catalogue furnishing items, rather propose customised and tailored solutions. Style and materials: the researched pharmacy of the future shall have a minimal, modern style that will also be reflected in the choice of materials, with a preference for hi-tech materials (steel / crystal) or natural materials (wood, etc.) in line with the wellness and wellbeing values. Target: the pharmacy of the future shall be a cosy and human centred place, addressing a very wide public, as it truly represents a “retail space” aimed at the customer experience. The concept shall not be created for a specific country but may be applied to various international contexts. Deliverables: upload all the materials that better present your projects (rendering, images, sketches, descriptions, etc. ), providing a textual description of your proposal of at least 150-300 words and, if necessary, remember that you can also attach a .ZIP archive containing extra materials. Participation is free of charge and open to designers and creative talents of any nationality aged 18 years or older. Participants can present one or more projects, but only the projects published on the www.desall.com web site, via the upload page related to “Future Pharmacy” will be accepted. The selection of the winner by Th.Kohl will be the result of an unquestionable evaluation and it will take into account originality, feasibility and consistency with the brief presented. 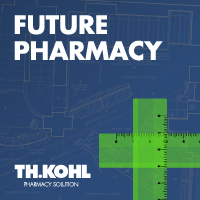 Do you want to stay updated about "Future Pharmacy"?